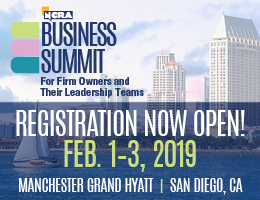 Take your business and yourself to a whole new level at the NCRA Business Summit, formerly the NCRA Firm Owners Executive Conference, in sunny San Diego, Calif., from Feb. 1-3, 2019. Freelancers, firm owners, and managers all will find something in the expanded program, which will include two keynote speakers, compelling panel discussions on topics critical to the growth of the profession, and even more networking opportunities than in previous years. Also making a comeback is the Super Bowl Party to close out the event – another great reason to stay overnight Sunday for an extra few days to really get to know this one-of-a-kind city. In addition to the networking events and backdrop of San Diego, the NCRA Business Summit will feature business-focused education and access to high-end speakers and panelists who will not only inspire your business development but will also become a part of your network to help bolster your company into the future. The Business Summit will feature keynote speaker Eunice Carpitella, a professor at the Wharton School at the University of Pennsylvania. At the core of this workshop, Guts, Grit and Glory, is the practical idea that simple shifts in our routine patterns of interaction and mindset make it possible for business leaders to include, engage, and unleash everyone in solving problems, driving innovation, and achieving extraordinary outcomes. As business owners embrace a fierce pace of change in the business world, merely having an answer today or a solution to a problem now is insufficient for what lies ahead. The way we navigate and respond to these changes is paramount to our success as business leaders. We will learn and practice models for change that build trust, promote effective relationships, and create environments that elicit our best selves. This strategic workshop will provide attendees with the opportunity to work “on” your business rather than “in” your business. Attendees will be invited to consider making small changes and implementing simple norms that, when applied, generate big results that can be applied by everyone at every level, from the C-suite to the front line of any organization, large or small. Workshop participants will consider why business owners and leaders fail. Let’s face it, we all know how challenging it can be to do things differently. In fact, studies show that when doctors tell heart patients they will die if they don’t change their habits, less than 20 percent are successful in changing their habits. The same holds true in a business environment. We have all worked hard to become experts in our field; yet, mastery does not guarantee sustainability or ensure legacies. In order to thrive, we must now become relentless and curious learners. This workshop is highly experiential and will comprise a multitude of learning modalities to include an interactive and informative presentation, round-table discussions, individual reflection, and opportunities to connect at large by tapping into the expansive and talented resources among all participants. Attendees will be inspired to practice new behaviors of personal courage, innovation, and inclusion that they can implement upon their return to the workplace. A Superbowl Party for the Win! Wind down your Business Summit experience with one final networking night at the NCRA Super Bowl Party. Come for the food, come for the commercials, come for the game, but most of all come for the connections you can make with other like-minded business people. The most valuable player award will go to everyone who attends and learns more about how to help their businesses and the profession at large prosper in the future. Come early and stay late. This is an event where everyone goes home a winner!